Tugger Trailers (TT) from BHS offer bulk transportation of materials across floors and ramps, and hitch to one another to create high-volume material-handling trains. 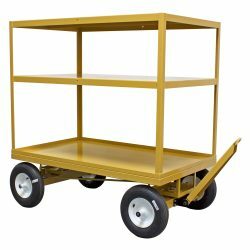 They are a crucial component of a pick-to-cart strategy, in which order pickers fill trailers to capacity, and tuggers travel in waves to collect items in batches.These industrial carts are ideal for order-picking applications, as a supplement or even a replacement for lift trucks. Manufacturing facilities also use Tugger Trailers to move materials from one point in the production line to the next. Rather than carrying a single load at a time, as forklifts do, trains of Tugger Trailers allow a tugger operator to transport multiple loads in a single trip. Heavy-duty steel construction with a durable powder-coat finish make Tugger Trailers suitable for harsh industrial environments. Custom designs are available for specific applications. Call BHS at +1 314 423 2075 to learn more about Tugger Trailers, or to find your local dealer. Ergonomic and maneuverable for manual- or tugger-pull operation. Improved tracking fidelity with all-wheel steering. Logistics trains consisting of electric tuggers and a train of Tugger Trailers are the ideal material handling system for a wide variety of applications. They allow for pick-to-cart strategies in distribution centers and in-plant milk-run logistics for manufacturers. Any application that needs to get goods from here — a source point — to there — a use point — and back again can benefit from heavy-duty steel Tugger Trailers from BHS. Single Tugger Trailers also improve material handling efficiency in manual-pull scenarios. A single employee can navigate Center Steer Tugger Trailers easily through the facility, even when fully loaded. Every model of Tugger Trailer from BHS can be customized or even engineered and manufactured from scratch to meet your specifications. All BHS Tugger Trailers are built for industrial settings, with steel construction and a durable powder coating. Casters are designed to roll smoothly over superflat warehouse floors or rough terrain, depending on the model. The main difference between the three stock models of BHS Tugger Trailers can be found in the steering assemblies; three different steering mechanisms are available, and each provides its own set of benefits for unique applications. Center Steer models include wheels at each corner of the frame, with a single, larger steer-wheel at the midpoint of the deck. The central wheel allows users to pivot the unit in place for unmatched maneuverability. This model operates best on smooth interior floors, and provides ergonomic benefits for hand-pull applications. Quad Steer Tugger Trailers are the most maneuverable models available for picking trains and milk-run systems. Both axles steer in tandem to improve the turning radius along the entire train, with precise tracking fidelity. At the same time, these models operate on rough surfaces and slopes. 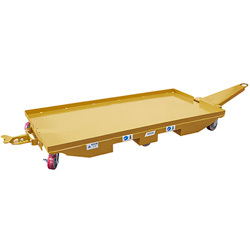 All Tugger Trailers from BHS come stock with universal tow bars and hitches for simple connection and disconnection to tuggers and one another. They are compatible with all major brands of tuggers, and feature high load capacities. As an original equipment manufacturer, BHS can design and construct Tugger Trailers to meet any specifications. Call the BHS sales team at 1+1 314 423 2075 to find out more about Tugger Trailers and other material handling solutions in your industry.